Christy is a wonderful NP. She has great bedside manner and knows her stuff. Great office staff all the way around. 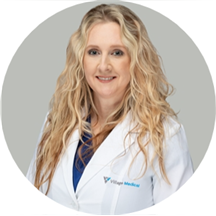 Ms. Christy Watts is a trained nurse practitioner catering to the medical needs of the communities in McDonough, Locust Grove, and Monticello, GA. She practices at Venture Medical Associates, where she is extremely popular among both her colleagues and patients alike due to her jovial and affectionate nature. Ms. Watts is hard-working, passionate, and loving, and caters to her patients with utmost care and concern. She is a member of the American Academy of Nurse Practitioners and the Sigma Theta Tau International, Honor Society of Nursing. She enjoys giving back to her community and has participated in many volunteering activities. Ms. Watts completed her master’s degree in nursing from Chamberlain University. She pursued her undergraduate education at Clayton State University. She sees patients for a variety of reasons such as acne, sore throat, pneumonia, shingles, and emphysema. Christy Watts got right to the point of my concerns. I am very pleased to have been seen by her and her associates.